Responsive Websites, and why you need one! | Responsive Websites, and why you need one! Responsive web design is a crucial part of website development today. When your audience visits your website; whether it being on a phone, tablet, or a computer you want them to have the optimal viewing experience for the device they're using. 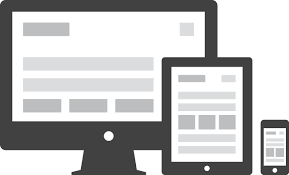 Meaning a responsive website will auto-adjust itself for the screen it is being viewed on. Before having a responsive site was the "norm" you would have to develop multiple versions of the same website, for example: a mobile version, a tablet version, and a desktop version. this proved to be quite tedious. Studies show one third of all internet traffic comes from a mobile device. If you have access to any type of analytics service, you will see the percentage of traffic using a mobile device on your website. You need to be sure to have a website that can easily adjust itself to type of screen or device that they are using. That's why it is important have a responsive design. Don't miss out on a third of your profit stream. So, why do you need a Mobile, Desktop version of a Website? Having a simple website that looks good on every device is half the battle of a website owner. A responsive website layout will provide you with a look and feel that is easy to maintain. Being able to access your website from any device is becoming more prevelant. Even google has announced that they have started showing results for mobile websites over the traditional non-responsive designs. Get your Responsive Website with Web Designer Domains Request A Quote.